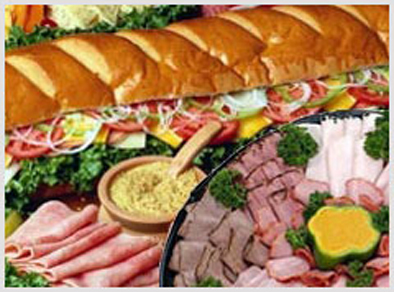 Other catering options may be available, contact us for more information. 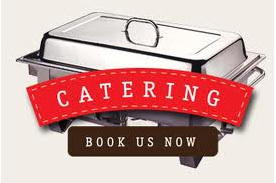 Full service catering includes, set up of chafing dishes and clean up after event. Paper Plates, Napkins, serve ware and silverware. Fresh Baked Dinner Rolls and butter are also included. Full Service required a minimum of 35 people. Broasted Chicken:Our Delicious Chicken is first marinated for 24 hours, then dredged in seasoned flour before broasting to a perfect golden brown. Broasted Chicken is flavored to the bone, not just skin deep like fried Chicken. Mostaciolli : Our Pasta Topped iwth Mama's Homemade Meat Sauce. For a small extra charge we can top it with Melted Mozzarella Cheese. Marinara also available on request. Kielbasa & Kraut:Premium Polish Sausage cooked to Perfection, then tossed in Delicious Sauerkraut. Italian Sausage w/Marinara:Sweet, Spicy Italian Sausage in a rich marinara with onions and peppers. Rudys Famous BBQ Ribs:St Louis Style Ribs, Slow roasted then finished on the open pit. Seasoned with Rudys Secret dry rub then smothered in Rudys famous BBQ Sauce. Fettuccini Alfredo:Fettuccini noodles in a rich creamy Alfredo sauce topped with a hint of basil and lightly topped with fresh shredded Romano Cheese. Homemade Cole Slaw:Sweet signature flavor . Fresh Cabbage, carrots and our homemade signature dressing. A Primo’s classic for sure. Our homemade Lasagna is made with only the finest ingredients. Layers of lasagna noodles, cheese and our meat sauce, then topped with our famous homemade meat sauce and mozzarella cheese and baked to perfection. (24 hr notice). The Lasana come uncut, so you can cut it to portion, or just spoon it per serving. Fettuccini noodles in a rich creamy Alfredo sauce topped with a hint of basil and lightly topped with fresh shredded Romano Cheese. Mozzarella cheese melted on top of spaghetti or Mostaccioli. Our chicken wings are fried to perfection and lightly seasoned. 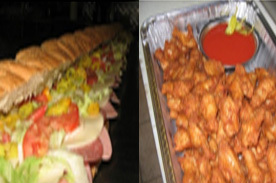 Served with your choice of Hot sauce, Barbeque Sauce or Ranch Dressing or variety served on side. Served with your choice of Hot sauce, Barbeque Sauce or Ranch Dressing or variety served on side. Your choice of either Italian or Turkey, prepared on oven fresh bread from Marino's Bakery and topped with the freshest vegetables. Each served Cold in their own carrying case and sliced for you. If picking up, ensure you have a large enough vehicle. As the bread is hot from the bakery, please allow a 24 hr notice. Note, if you wish items to be placed "on the side" there is an additional charge for packaging materials. Antipasto Salad-Crisp lettuce, Sliced Salami, Ham, Provolone Cheese. 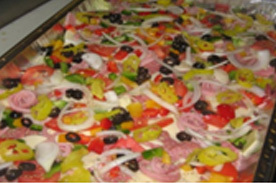 Onion, Green Pepper, Sliced Black Olives, Mild Pepper Rings, Tomato. Served with Italian Dressing. Greek Salad- Crisp Lettuce, Tomato, Whole Black Olives, Red Onion, Beets and Feta Cheese with Greek Dressing. Crisp Ice Berg lettuce, Tomato, Green Peppers and Onions. With Italian Dressing. Tri Color Rotini Noodles mixed with Sliced Black Olives, Carrot, Multi Color Peppers, Onions. Blended with just the right amount of Italian Dressing. Pasta Salad is made to order, so please allow plenty of notice. Mustard Potato Salad. 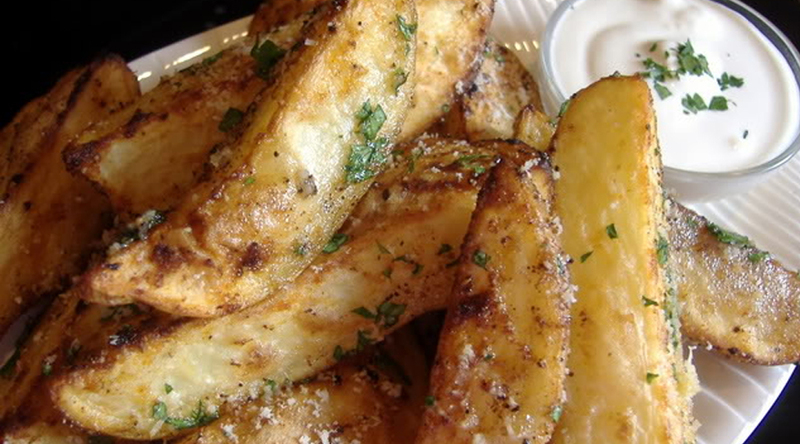 Great for a picnic or as a delicious side to one of our entrees. Our potato salad is moms secret recipe, but includes egg, celery, onion and potato. Potato Salad is made to order, so please allow a 24 hour notice. Rudy's famous Cole Slaw, cabbage & Carrot blended with Rudy's homemade sweet slaw dressing. Served with Ranch and Hot Sauce For Small 12 pieces of each item and for large 24 pcs. Served on round platters. Below Items are served in 1/2 pans or Full pans. 1/2 pan pricing is highlighted in yellow, Full Pan in White. Full Tray of garlic bread, topped with light cheese & garlic Butter. Sprinkled with Romano Cheese and cut into 48 pieces. The perfect addition to one of our delicious pasta selections. Does not come with sauce. Allow 24 hour Notice as the bread is ordered fresh from bakery. *As we strive to find only the freshest ingredients, some of our trays may require 24 hour notice. *Not all items listed. If you have another entrée in mind, please ask. We have talented cooks on staff and may be able to accommodate you. 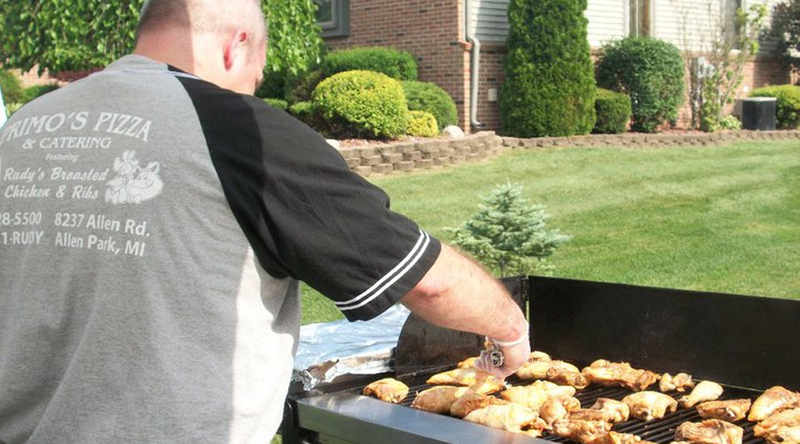 Let out staff come and cook on-site with our huge BBQ grill. It is the perfect addition to your summer BBQ. Imagine that, a BBQ that you can actually mingle and have fun rather than sweat over the grill. 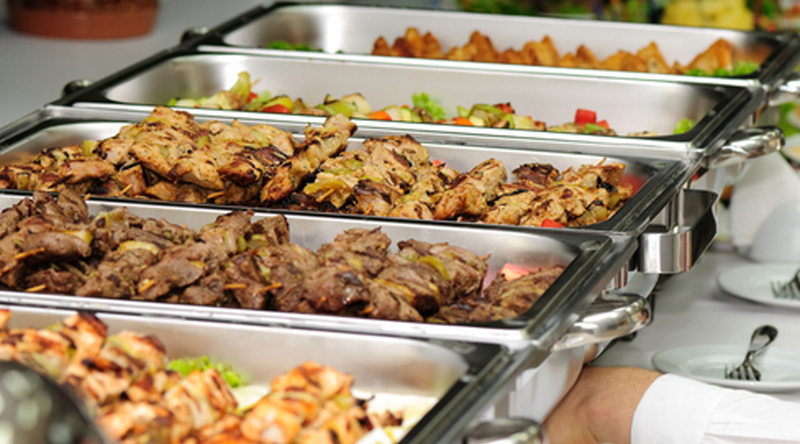 Our staff will cook on site and serve food buffet style. All American, BBQ Combo and Steak Feast. Rudy's Broasted chicken follows the genuine broaster recipe. Chicken is brought in fresh, then marinated for 24 hours and broasted to order. Each order below is divided into equal chicken parts, for example the 40 piece comes with 10 Breasts, 10Thighs, 10 Wings and 10 Legs. 24 - 48 hour notice required on all party trays! 4 Meats -Salami, Smoked Turkey, Ham, Roast Beef with 3 Cheeses-Swiss, American & Provolone With Mayo, pickle & Mustard. Accompanied by assorted specialty breads. Large has 4 meat/cheese (4lb) with 5 loaves of bread, Wheat, Italian, Rye & Pumpernickle (approx 100 Slices of Bread. for small additional fee we can include lettuce, tomatoe and sliced red onion. Cheese cubes cut into bite size pieces. No crackers, but toothpicks provided. Large has 5 Cheeses-Sharp Cheddar, Aged Swiss, Jalapeno, Marble & Pepper Jack. 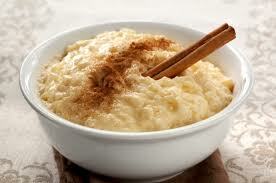 Strudel, Muffins, Cookies, Brownies, Rugala, Kifli, Danish and pastries. 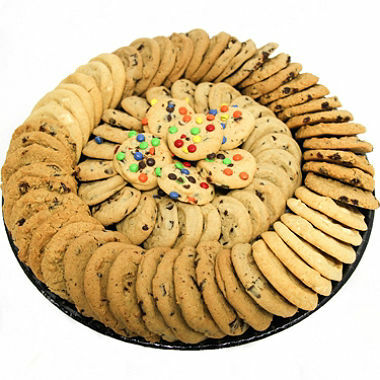 Small Tray has 40 cookies assorted, Mini cookies. like pictured above in the middle. 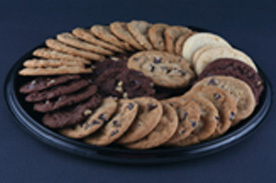 Large Tray has 84 Assorted Large cookies as well as smaller cookie assortment as pittured above.